When it came to creating minority-majority districts in the Pittsburgh area, there was already one naturally created using previous steps. But Pittsburgh had two minority districts in 2000. Would the shrinking population in Allegheny cost them a minority district? The quest for answers had begun. At first, it seemed like an impossible task. But then with fresh inspiration from hearing that others believed it was really possible, I tackled the region yet again and this time found success. Of course, it came at a small cost to political subdivisions. 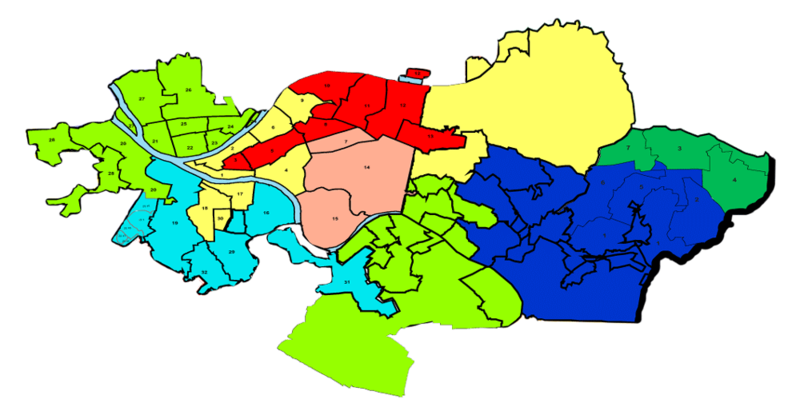 The Step 3 results only had one ward split, all 5 house districts contained within the city limits, and the townships (for the most part) whole. It shows the City of Pittsburgh and few of the townships located East of the City. The minority district is colored red. Once Step 4 was complete, the results were not quite as neat and tidy. Still, the impact was minimal. Only two city districts now were shared with the neighboring townships and only one additional township was split. 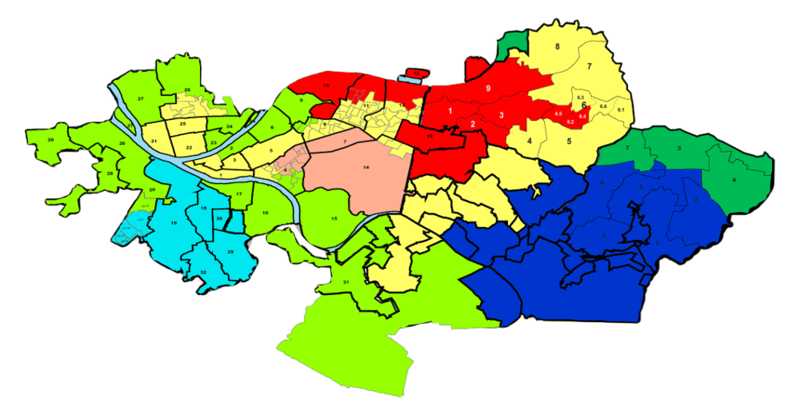 The minority districts are red and yellow (the northwest one). In each, the black minority population represents 54% of the district (and 50% of the over 18 population). Some of the shapes are a little funny, but are justified by either forming a minority district or keeping political subdivisions whole. Based on other minority districts in other states, this would be considered compact. Here are side-by-side comparisons of Step 3 and 4. And there you have it: two minority-majority districts in Pittsburgh, Allegheny County with minimal impact to political subdivisions — just like the PA Constitution requires. While not known when creating these maps, they also address the concerns raised by citizens testifying at the Pittsburgh Public Hearing. Many pleaded for Ward 19 to remain whole, it does so on the map. One asked that Ross Twp have one representative, it does so on the map. A few asked that two minority districts still be preserved, and so they are on the map. This is a small proof of how the proposed system brings together the requirements of the law and the needs of the people. The old methods resulted in numerous problems for communities, as the testifiers pointed out. The Holt Proposal creates common sense maps leaves the people the winners. See how all this fits in with the big picture by revisiting the PA House Overview. Just had to say thank you for all that you are doing. I’ve been an opponent of our system of redistricting for the last 50 years, but all I ever thought to do was to complain to my legislators and write letters to the papers, plus donating to the League of Women Voters. You are truly a remarkable young lady and hopefullly will show other young people that we can make a difference. Thanks again. I live in Ross township. Would it do any good if i sign up to terstify to keep Ross whole under your plan?